When it comes to boosting muscle growth and promoting fat loss, we know that diet and exercise is the key. But that doesn’t mean we shouldn’t look to supplements to gain a little edge and enhance our results. And one of the most interesting supplements to hit the market in recent years is D-Aspartic acid (or DAA for short). D-Aspartic Acid is a specific type of amino acid, and an isomer of L-aspartic acid (LAA) – which is one of the 26 base amino acids used to make the body’s many protein structures. DAA is found within the human body in trace amounts, and in some of the foods that we eat on a regular basis (such as milk and dairy, eggs, red meat and poultry, and some fish) – although again, only in very small amounts. Interestingly, despite its relative scarceness within the body, DAA appears to play a very important role within our neuroendocrine system, in which it stimulates the production of human growth factors and key anabolic hormones. With this in mind, the supplementation of DAA has become commonplace gym junkies and athletes alike, where it has been suggested to enhance the production of testosterone, growth hormone, and insulin like growth factor 1 (also known as IGF-1). As each of these compounds are highly anabolic in nature, it is thought that the supplementation of DAA can therefore enhance increase growth, facilitate fat loss, and enhance athletic performance. What Are The Benefits of Taking D-Aspartic Acid (DAA)? Taking the above into consideration, we wanted to take an objective look at the research around DAA to determine how effective it truly is – and I must admit, we were pleasantly surprised. Does Taking DAA Boost Testosterone? There is a number of studies looking at the effectiveness of DAA for boosting testosterone production. Current research is quite positive, with as little as 12 days of supplementation demonstrating associated increases in the levels of testosterone found within the blood in individuals with both low and normal testosterone levels [1,2]. It is also important to note that one study actually demonstrated a decrease in testosterone levels when supplementing with excessively high dosages, although the exact mechanisms for this are unclear . Does Taking DAA Affect Other Hormones? There has been some research to suggest that supplementing with DAA can also cause declines in both estrogen and cortisol levels . As estrogen somewhat mitigates the action of testosterone, and cortisol is considered highly catabolic, their reduced secretion may both enhance the action of available testosterone and create a more anabolic environment within the body. This suggests further ability for DAA to enhance muscle growth and fat loss. Does Taking DAA Boost Performance? And finally, in conjunction with the above, the supplementation of DAA has also been shown to have a positive effect on muscle strength  and muscular power , with its consumption demonstrating clear improvements in each of these variables in comparison to a placebo. This suggests that in conjunction with its desirable effects on the body’s hormones, DAA supplementation may also positively impact athletic performance through a number of different mechanisms. How Much D-Aspartic Acid Should I Take? So, given the results of the studies mentioned above, it appears that 3 grams of DAA per day is enough to cause increases in testosterone production, declines in estrogen and cortisol secretion, and improvements in physical performance. As a higher dosage of 6 grams per day has actually been shown to reduce testosterone levels, we strongly recommend that you do not exceed an intake of 3 grams per day. In conjunction with this, it also appears that it is in your best interest to ‘cycle’ your DAA supplementation, so that your body doesn’t get used to having constantly elevated levels within the blood. With this in mind, we recommend taking DAA for two weeks straight, followed by 3-6 days of no supplementation. This cycle can then be repeated indefinitely to maximise the effectiveness of your DAA supplementation. 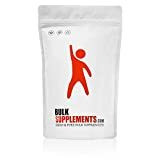 When it comes to producing simple and effective supplements, its hard to look past BulkSupplements. Opting for a no fills approach to their products, these guys are well known for offering affordable options that work extremely well. Their D-aspartic acid powder is a prime example of this, providing us with nothing but pure DAA in a micronized powder form, and at a very low price point. This is one of the most popular options on the market, and a fantastic choice for literally anyone looking to introduce DAA into their regime. This product by Nutricost is another fantastic option. Using nothing but pure high-quality d-aspartic acid powder, it contains no fillers, and provides everything you need to promote muscle growth and enhance performance. As an added bonus, this particular supplement comes in a solid 300-gram packaging, providing you a whopping 300 servings for minimal cost. Primaforce have been making high quality supplements for a very long time, in which they have built a very good reputation within the health and fitness industry – and their DAA supplement is a prime example of this. 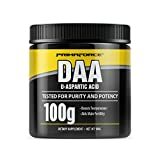 Similar to the above supplements, Primaforce use nothing but pure DAA powder, offering excellent quality while ensuring you aren’t wasting your time with any fillers. 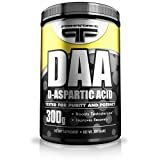 D-aspartic acid is a great supplement that has the potential to effective hormone production in an extremely positive manner, in which it creates a highly anabolic environment within the body. This is likely to enhance both muscle growth and fat loss, and appears to improve various markers of athletic performance, including muscle strength and muscle power. The three DAA supplements listed in this article are what we believe to be the best on the market at the moment, each acting as a great option in their own right. If you have had any experience with DAA supplementation we would love to hear about it, so drop us a comment and we will get back to you ASAP.